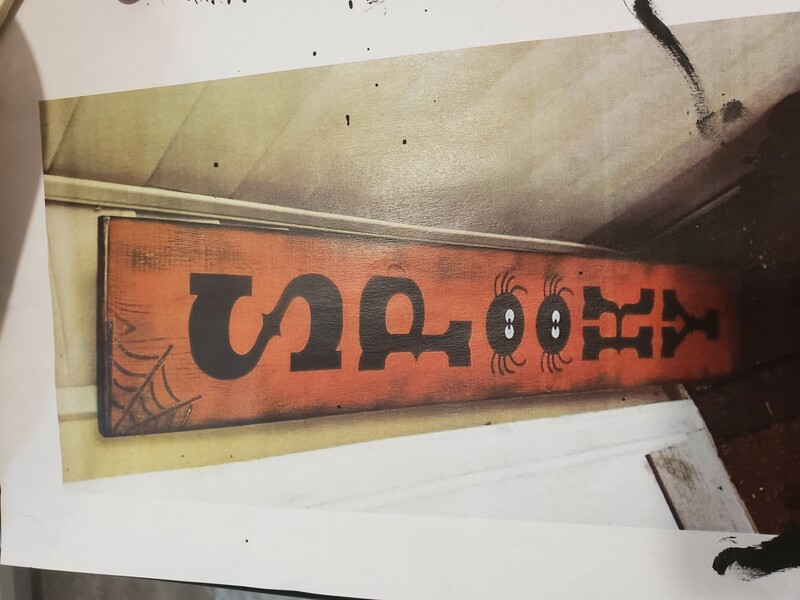 How can I make the black paint marks on the side of this sign as shown in the photo? I can't seem to make them identical to the photo. I have tried using a foam paintbrush, a rag, and a sponge. That is called a vignette. Basically it is a soft blend of the dark edge that frames the outside of a picture (or any image like a photo or movie frame) into the outer areas of the front face. Here I would say they used a rag painting technique. Apply the black paint along the outside edges of the board and along the bevel or rounded edge of the outer face of the sign. Then with a rag rub toward the center of the front face a short way (around 1/8 - 1/2") to get the heavier dark edge. Do this with some randomness and skip areas to make it uneven. The action is a little like applying shoe polish. Then wipe a little further in toward the center with just a touch of paint on the rag. Likely you will then want to wipe those areas away with a clean rag, maybe with a little solvent on it, to reveal the base color and create the wider faded parts. The base color has to be dry and oil based paints will work better than acrylics since they dry slower giving you more working time. By varying the pressure as you wipe away the top layer you will get darker and lighter areas. The grain of the wood helps since the valleys hold the paint and the ridges will be wiped away. Do some test runs on a practice board because there is a some finesse to the amount of paint and touch to use. It seems that the wood was painted black first and the red paint was applied afterwards over stencils, most likely with a rolled. So for this effect apply black paint/ink first and red paint/ink with an under-inked roller afterwards. Not the answer you're looking for? Browse other questions tagged painting paint acrylic-paint or ask your own question.